Must away and make a cuppa.. So pretty, and will be a lovely quilt when Southern Hemisphere Spring rolls around again! 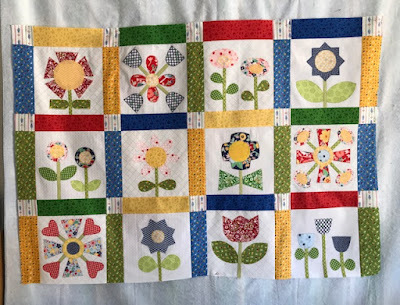 Such a bright and cheery quilt! A couple of my friends have started this one, but I don't think they ever finished. These are gorgeous, happy blocks Maria! Oh this is taking shape so beautifully Maria, great work! Looking good. It’s so bright and fresh. Three whole rows! Don't they look good!